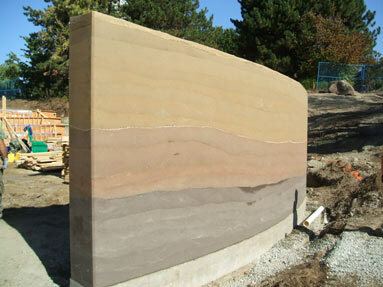 Here are a few pics from the UBC walls this summer. 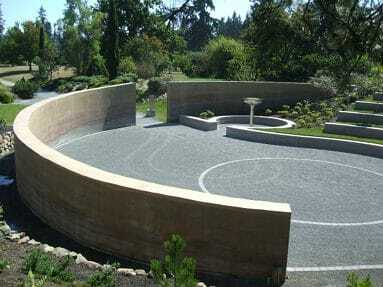 These curved walls form the backdrop to an amphitheatre and are are 80′ and 55′ long respectively. 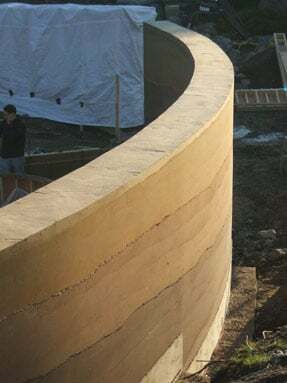 These curved rammed earth walls are quite immense, although they look small when we pull way back to fit both walls in the picture. 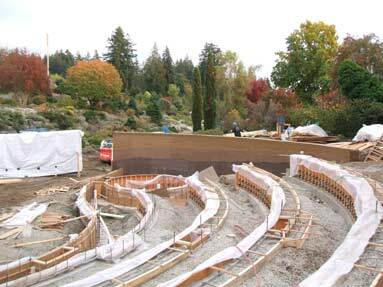 A nice shot showing the curvature of the walls with the fountain in front of the second wall. 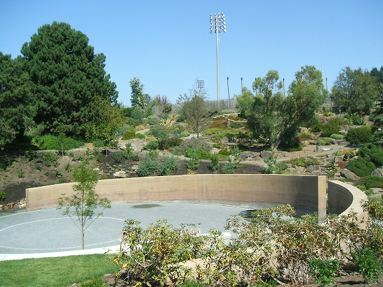 A better view of the fountain with the amphitheater seating to the right. 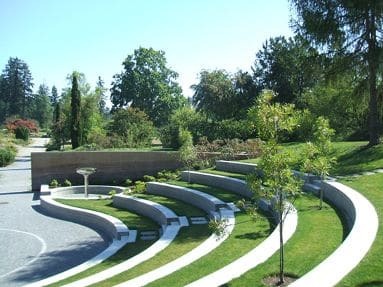 Amphitheater seating looking toward the east entrance. 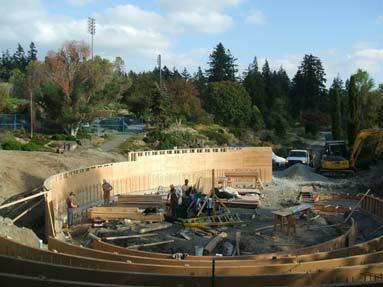 A view looking at the north wall from the entrance to the amphitheater. 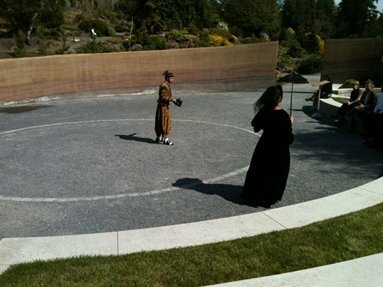 A theater performance on opening day. 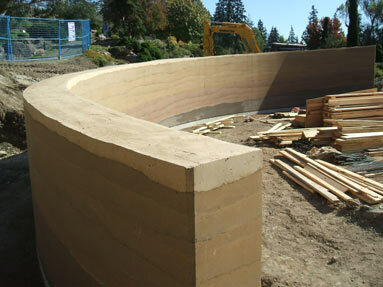 We are now onto building the second rammed earth wall in the UBC botanical garden. 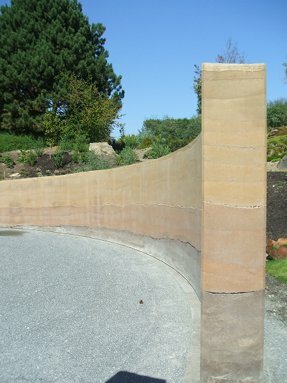 This wall is 55 feet long, curved and fades into the grade. Thanks to Katie who works at the garden for providing a few of the pictures scattered through our posts on the amphitheatre. 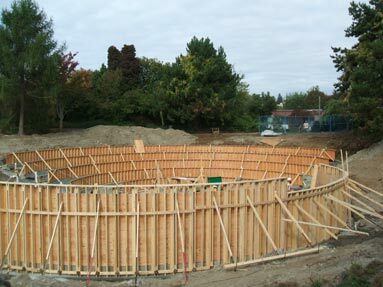 The footing for wall 2 is ready. 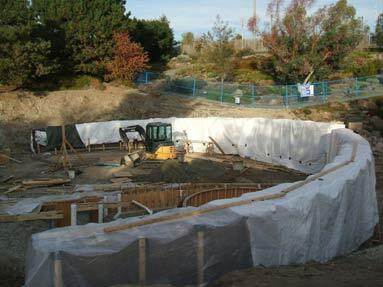 The round circle to the right is where the fountain will be going. Adding sheets of plywood to the walers. 1 side of the forms is now up and defining the shape of the site now. 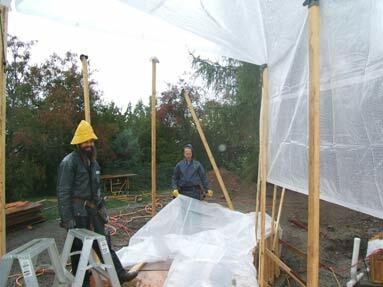 Not every day can be sunny so here we are putting up tarps in the rain. Rudy is a happy man now that the sun is back. Delivering material up the hill. We used a bobcat with tracks since we had a muddy climb to deal with. 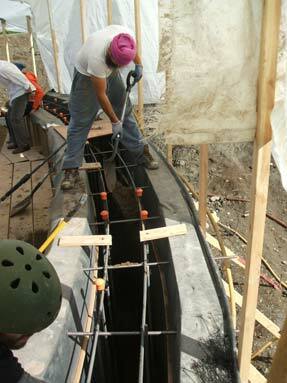 Quality control on the rebar placement. The pneumatic ramming in dramatic fashion, operated by Rama. Ramming is complete. 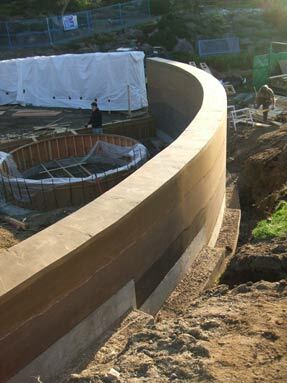 A curved wall always looks great from the top. 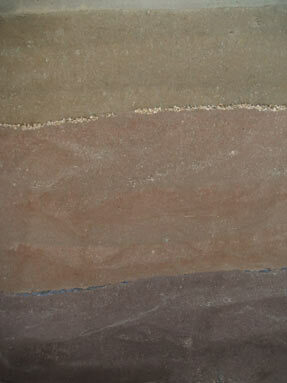 Beautiful layers…we love these walls. Wall 2 from a distance, it will eventually have a fountain if front of it. We are totally delighted with the wall texture and layering. Each line you see is a lift layer that has been compressed. 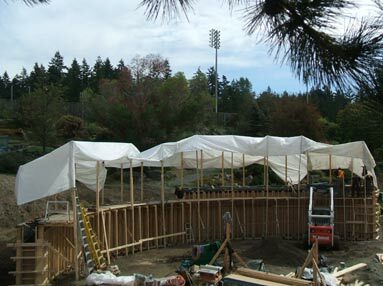 The walls are tarped and this part of the project is done. Come back to see the finished pictures in the spring when the flowers are blooming and the whole site is looking magnificent. Mixing and more mixing, filling up those forms takes a lot of material. More shoveling. 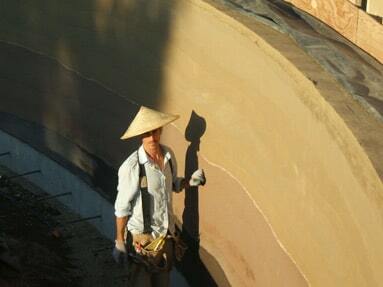 We shoveled a lot on this wall, over 117,000 pounds of rammed earth mix! 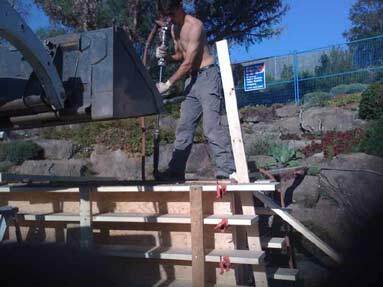 Rudy working the pneumatic tamper. Working late to finish the cap. 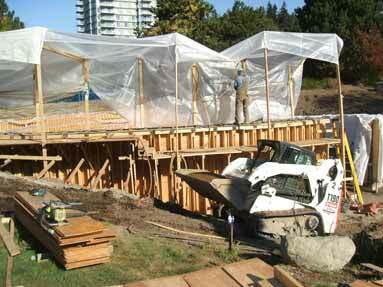 Removing the forms and exposing the beautiful rammed earth! Clifton with his stylish hat, makes a nice shadow on the wall. Tree shadows on the wall. Note the backdrop, the botanical garden is such a nice environment to work in. Spraying the wall lightly to slow the curing. 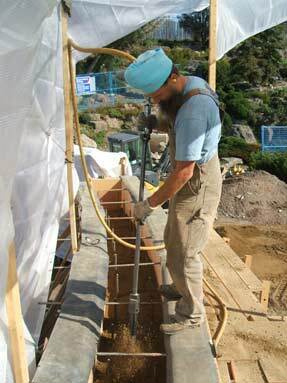 The slower the curing, the higher the strength of the rammed earth. 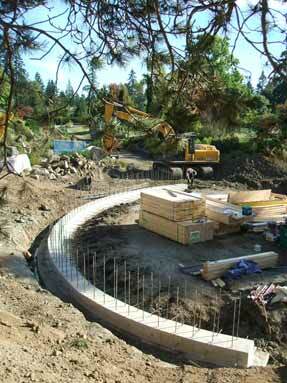 A great angle to show the extent of the curve and slope. 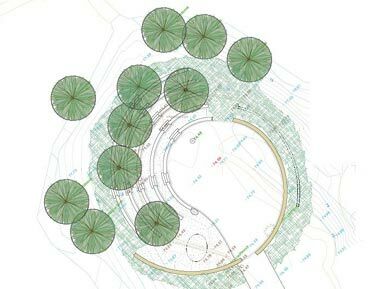 The cap has been troweled to look more organic and slope slightly to the outside of the amphitheatre. 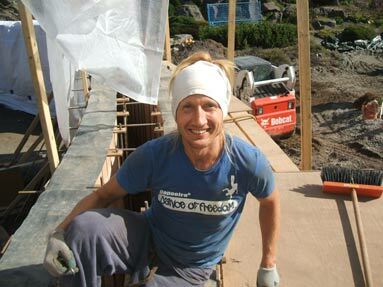 The tall end of the wall reaches 8.5 feet in height. A great view from the back of the wall that shows the slope. 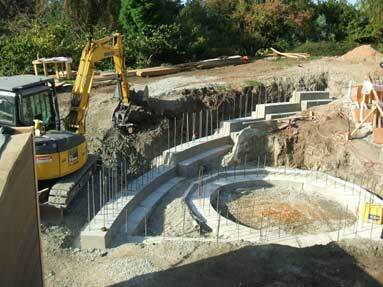 The forms for the concrete seating is in the background. 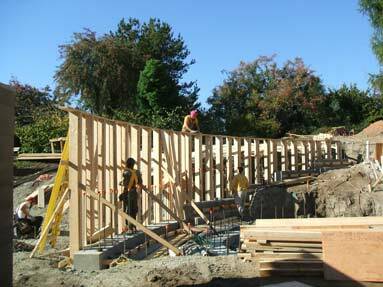 The first wall to get formed up is the largest of the 2 walls, this wall is not only curved but sloped up on the top. 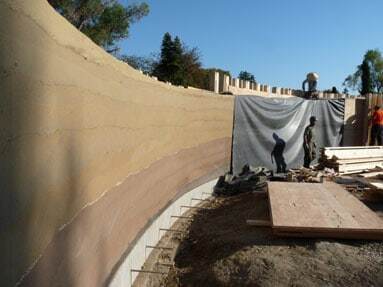 We are forming what will become a huge rammed earth wall for the backdrop to the stage performance area, it is 80 feet long and averages around 6.5 feet in height. The footing is in and ready to go. 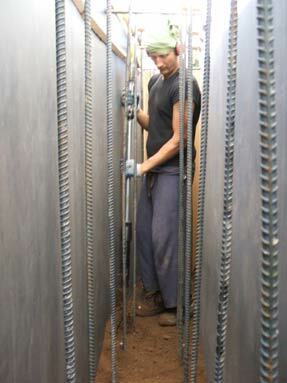 The footing has a stem wall which is unnecessary and not normally what we do. 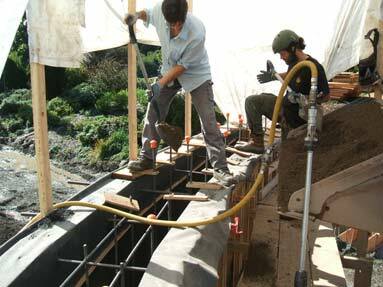 With stabilized rammed earth you can build directly on the footing and bury part of the wall below grade. Yashwant and Rudy are building double whalers that have a space in between so threaded rods can be inserted between them. 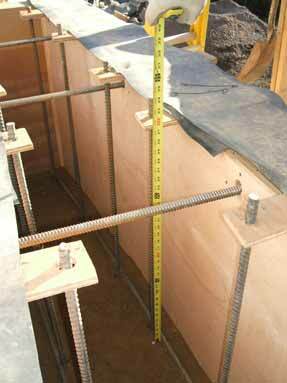 These walers also have a flat 2×4 on the side so the plywood sheets can be attached when they meet. 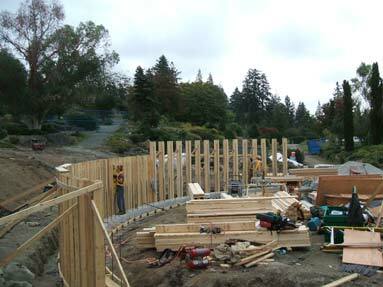 Building of the forms is progressing with the aligning of each waler underway. 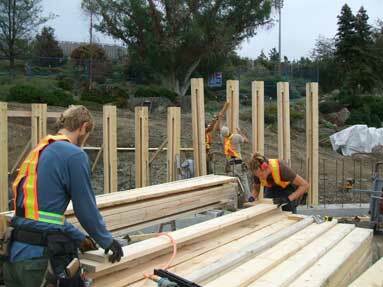 The first layer of plywood is attached. 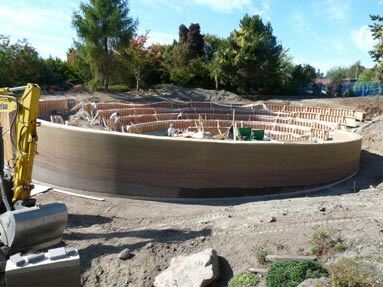 We used 2 layers of plywood to reinforce the forms since it is more difficult to bend 1 layer of thicker plywood to make curves. 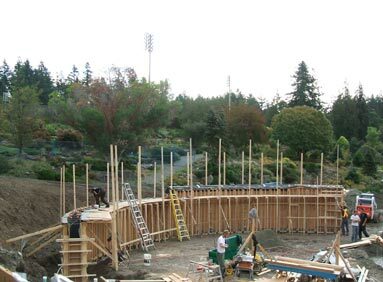 A view from the back which also shows the forms for the concrete seating in the background. 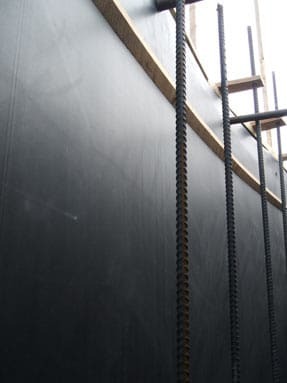 We used a rubber form liner to cover the plywood mitigate lines from plywood joints etc. 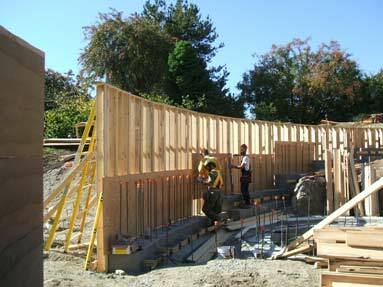 The strip of wood that is sloping and chamfered is the pour strip that show us the grade of the wall and what level to trowel the cap to. 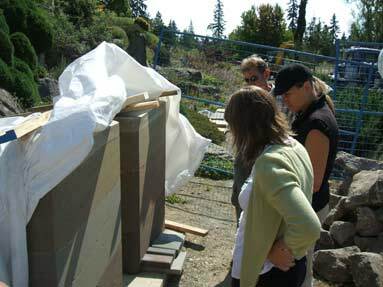 Putting the finishing touches on the forms. 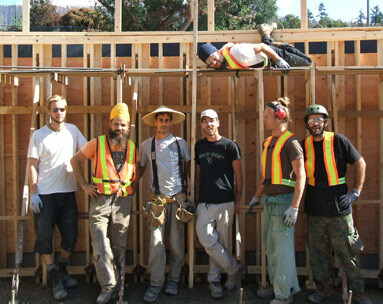 The rammed earth builders on this project from Left to Right: Yashwant, Rama, Clifton, Trevor, Rudy, Jedediah and above on the platform is Ashar. The canopy is up, the forms are complete and it’s time to start ramming! 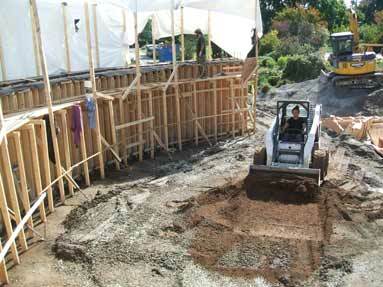 This is the start of a fantastic project to build the 2 largest rammed earth walls on the west coast of BC, Canada. 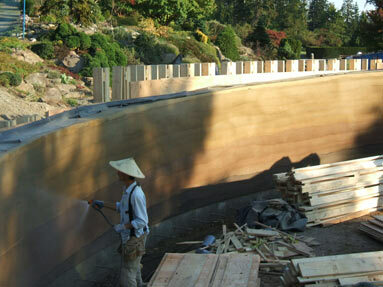 The project is located in the Botanical Garden at the University of British Columbia (UBC) in Vancouver, Canada. 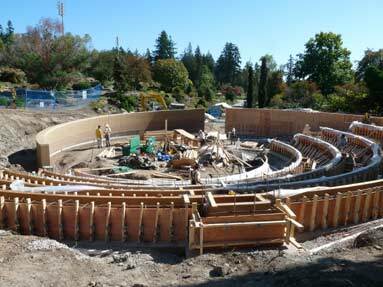 The big walls will form the stage backdrop and surround about 1/2 of the amphitheatre to the south of a sculptural fountain. 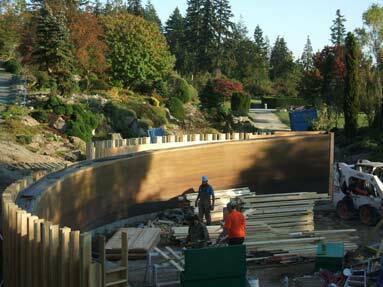 This world class landscape architecture was conceived by Forma Design of Vancouver, BC. 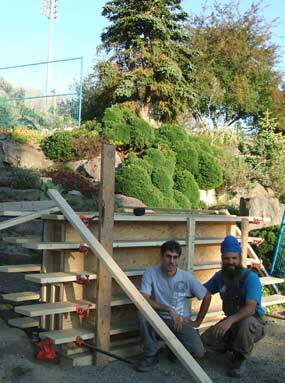 We built this project in partnership with Aquarius Contracting’s Rama Khalsa who is apprenticing with us. 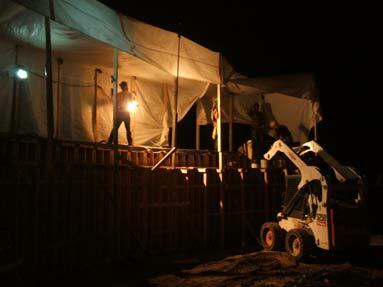 This post will show the 2 test walls we built at the start of the project to make sure everyone involved would be pleased with the color and decorative choices before we scaled up to the large walls. 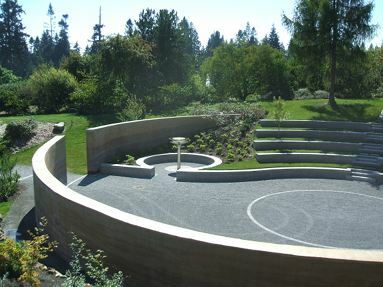 Amphitheatre plan courtesy of Forma Design. 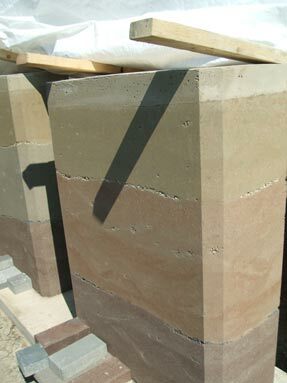 The 2 rammed earth walls are shown in beige. One of the key elements of the design is the use of the geometry of the Fibonacci sequence. The Fibonacci sequence it essentially nature’s numbering system that forms the design of most living things on earth. Clifton and Rama. 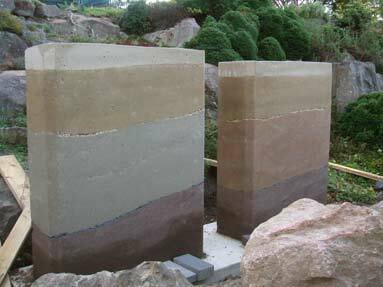 Test wall forms are ready to go. We made the 2 walls slightly different, changing the middle color but leaving the top and bottom the same. There is decorative rock between each color change. 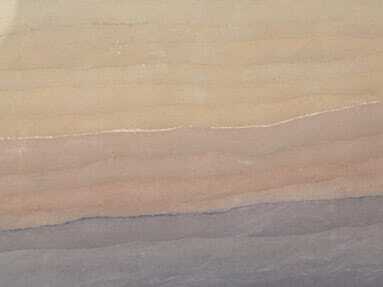 The slope of the layers is to mimic the slope of the big walls. Viewing to choose the preferred wall. The winner is … test wall 1. A closeup of the chosen wall. We are now ready to move on to building on a larger scale now that we are sure we are on the right track.